Make sure your valuable personal property is protected! 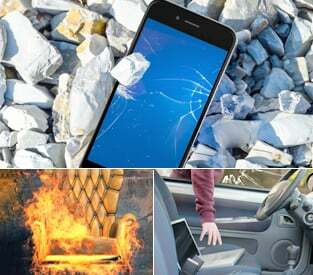 Mishaps can happen at any time, Worth Ave. Group can protect your belongings against cracked screens, spills, theft and more! Our College Plus insurance plan protects students against theft, damage and other causes of loss to student personal property that may occur while away at college, or even studying abroad. With College Plus, student personal property will be protected world-wide. The College Plus Insurance covers computers, laptops, iPads, tablets, iPhones, smartphones, iPods, mp3 players, and other personal electronics. We also cover school books, clothes, bicycles, musical instruments, and sporting goods. Our 24 / 7 College Plus insurance protects you against theft, burglary, fire, vandalism, accident and water damage; as well as natural disasters like flood, earthquake, and power surge due to lightning. College Plus Insurance is also available to any college university graduate students. Be protected for personal and university-issued property on or off campus. Replacement cost protection. World-wide coverage. Insure your valuable personal property! Determine the Right Amount of College Plus Coverage And The Right Deductible and Premium To Fit Your Needs. Our most popular College Plus personal property insurance plan is the $6,000 coverage limit for a twelve (12) month policy period. ... purchase any coverage amount starting from $2,000 up to $10,000 coverage. ... choose a deductible from $25, $50 or $100. ... select a plan term of one, two, or three years duration (the one year plan has an option to auto-renew). Loss or Damage to stereo disks (including CDs, Video CDs, DVD, MP3 and Video Games), records, software, albums, cassette tapes (including video tapes) is limited to $1,000 for any one loss.Coverage for jewelry, watches, rings and other items consisting of gold, silver or platinum or furs is limited to 20% of the policy amount (i.e. $2,000 policy allows $400 total jewelry coverage) for any one loss.Coverage for bicycles is limited to $500. Insured property in a personally-owned automobile is covered, provided that the vehicle was locked at the time of theft and there was visible signs of forced entry into the vehicle. + Automobiles, motorcycles, boats, motors, aircraft or aircraft parts or any other type of motorized land vehicles or other conveyances or their accessories (including car stereos, GPS devices, etc.). + Transportation tickets or other tickets. + Merchandise for sale or exhibit. + Money in currency or coin, evidences of debt, letters of credit, passport documents, notes, securities. + Artificial teeth or limbs. + Pharmaceuticals – prescription or over-the-counter. + Artwork – professional or amateur. 30 day waiting period required on accidental damage claims (including spills, liquid submersion and cracked screens) for new enrollees. Note: The descriptions of plan coverage on this web site are non-exhaustive and general in nature and are not intended to be a replacement for your actual plan language. For a full list of exclusions and conditions applicable to your plan, please refer to your policy booklet and, if applicable, its state insert. For questions regarding the purchase of policies, policyholders may contact Worth Ave. Group at 1-800-620-2885 or via email at customerservice@worthavegroup.com. For questions regarding claims, please call 1-800-620-2885 and select Option 1. Worth Ave. Group’s College Plus policy cover property if my student lives off-campus or at home? Yes. We cover property on- or off-campus. Your student does not have to live in campus housing. Our coverage is worldwide. Yes! We are happy to say that after graduation we can extend coverage indefinitely for students who have a current policy with us. Does Worth Ave. Group’s College Plus policy cover bodily injury or property damage liability for which the student is liable? No. Dependent students are typically covered by their parent’s homeowner’s policy for liability. Does Worth Ave. Group’s College Plus policy cover property that is rented, borrowed or belongs to someone else? Yes, it covers property in the care, custody or control of the policy holder. Who is your underwriter and what is their rating? NAIC#: 22292 | AM Best Rating: A for financial size category of $1.25 billion to $1.5 billion. Restrictions May Apply: Please review your policy booklet for full coverage details. We do accept applications online which can be accessed by clicking here. However, if you prefer to apply via fax or mail you may download the application below. If you have any additional questions regarding your application, please call customer service at 1-800-620-2885 or email us at customerservice@worthavegroup.com. College & Universities: Keep your students protected when mishaps happen! Send informational pieces to students to make sure they are covered! Brochures provided at no cost to you! If you would like to pass out our College Plus brochures to your parents/guardians, students and staff please fill out the form. Please enter a value between 1 and 25000. * When Would You Like To Receive Your Brochures?